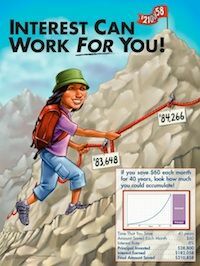 The Interest Can Work For You poster shows students how interest - with regular saving and investing - can help them earn a sizable amount of money for retirement. The Interest posters come with a 24-page Teacher’s Guide that contains activities, visuals, and a greater breakdown of interest. Allow your students to experiment with a Compound Interest Calculator to see how their money will build over time, and a Debt Reduction Planner to let them get a feel for how quickly debt can get out of control, and good ways to create a payment system. Have your students estimate the costs of living alone. Include an estimated salary, and research costs of living. Teach your students to live within their means, without relying on credit cards.